McDowell House offers the unusual opportunity to stay in an exquisitely restored historic residence in one of Lexington's most beautiful neighborhoods. Surrounded by other 19th-century properties, the house sits just blocks from Washington & Lee, VMI, and downtown's restaurants and shops. A deep front lawn and tranquil gardens provide quiet and privacy. McDowell House sleeps 6 guests--or up to 10, when combined with the property's 3rd floor apartment, McDowell Studio (VRBO #339861). Combined bookings receive a special rate. All beds have high-quality mattresses, silky all-cotton linens, and hypoallergenic duvets. McDowell House's charming 1st-floor Garden Bedroom features a tall-post double bed and a window overlooking the secluded rear garden. An adjoining tiled bathroom retains its original marble sink and claw-footed tub, but with shower mounted above. On the 2nd floor, the West Bedroom has a queen-sized brass bed and tall windows on 3 sides. The Turret Bedroom features an elegant pair of antique brass twin beds and its own little circular porch overlooking the front lawn and mountains beyond. Two well-appointed bathrooms serve these bedrooms: a marble-floored bathroom next door with tiled shower and claw-footed tub and the house's original bathroom, on the same floor, which contains a sauna and shower. Guests may use a rowing machine, Nordic Track, exercise bicycle, and vibration platform conveniently located in a nearby 2nd-floor conservatory and porch. McDowell House has an amazing eat-in kitchen with original wainscot, Virginia soapstone counters, and state-of-the art appliances--from restaurant-grade gas stove to espresso maker. With windows overlooking both rear and side gardens, it's the perfect place to enjoy cooking--or eating--local vegetables, meats, breads, and cheeses. Glassware, china, flatware, and serving pieces make dining, entertaining, or enjoying take-out easy and fun. McDowell House is a magical place to spend time with friends and family. A large, airy parlor with tall windows opens into the generous dining room, via sliding doors. The sunny library provides comfortable space for reading, working, watching television, or catching up on the day's activities. Rooms feature luminous colors and period carpets, wallpapers, and curtains. Art covers the walls, as it did in the 1890s. Musical guests love playing the c.1890 ebonized Knabe piano in the handsome 1st-floor hall. Visitors also enjoy lounging on the porches that wrap the house. In the back garden's rock-lined pool, goldfish swim among the waterlilies. A round table and chairs sit on a stone terrace, surrounded by lush Japanese maples and evergreens, ferns, and native woodland plants. McDowell House provides a quiet refuge--and a perfect base for visiting Washington & Lee and VMI, exploring scenic Rockbridge County, and enjoying Lexington's vibrant downtown. The owners' award-winning restoration work has been featured in magazines such as Preservation, Early American Life, Victorian Homes, Traditional Homes, and Southern Living. Lexington combines the intimacy and friendliness of a small Southern town with the diversity created by universities. Located a short drive from stunning scenery--Natural Bridge, Goshen Pass, the Blue Ridge mountains--the city is also linked to the country by walking trails. Local meat, eggs, vegetables, cheeses, ice creams, breads, beers, and wines make Lexington a wonderful place to dine--out or in. McDowell House is just blocks from downtown's shops, bakeries, farmer's market, wine shop, and micro-brewery. Its location encourages walking to everything: the newsstand, exercise classes, the whole foods grocery, the movies. At McDowell House, the car stays parked! Air conditioning on 2nd floor can cool entire house, if needed. The kitchen's stainless steel KitchenAid refrigerator has French doors and a bottom freezer with ice maker. A private garden behind the house provides a lovely outdoor space for dining, on a stone terrace. The garden features Japanese plants and a fish pond, where water-lilies bloom. Visitors can enjoy al fresco dining on the back terrace, surrounded by a garden of Japanese and 19th-century trees and plants. A separate bathroom with shower houses the sauna. Historic McDowell House offers a wide menu of modern comforts, including an exceptional kitchen and a sauna. This house provided plenty of room for our family and visiting guests. It is a true gem set right in downtown Lexington. We're looking forward to stay here again soon. 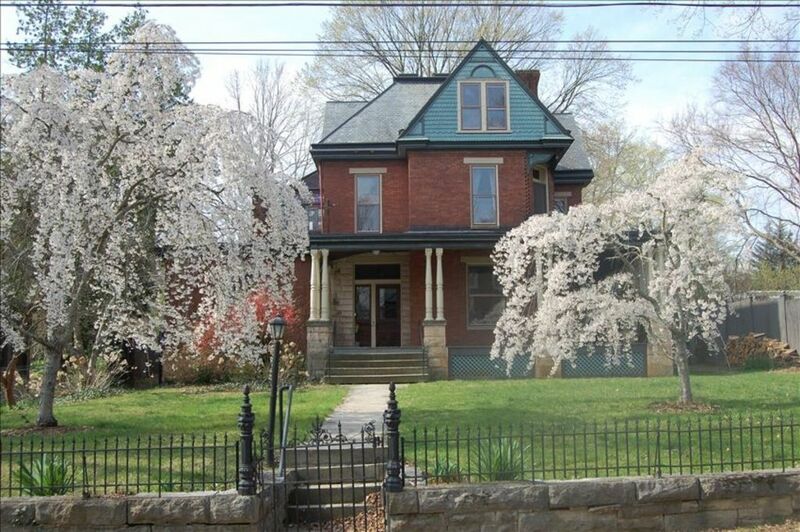 Great victorian home in old downtown Lexington. We were able to walk to all the historic sites and the home was perfect with a great back yard garden setting that we hung out in at night. Awesome house and i want to stay again next time we are in Lexington. Great kitchen & outside areas and plenty of space. My family of 4 spent four days here for my daughters law school graduation. This home was a great place to stay. Kitchen is top notch. We also really enjoyed side porch and back yard. Three large bedrooms and 3 full bathrooms. Very close to town, so we could easily walk to most places. Highly recommend this place! We rented the large home as well as the third store studio apartment for a wedding. The home meets the description perfectly -- two large bedrooms upstairs and one downstairs. Kitchen is extremely well equipped. Several sitting rooms as well as front and back porches. Very near downtown Lexington, VMI, W&L in a nice, quiet neighborhood with rabbits in the yard. Great stay in Lexington ! Great property. Clean, well maintained and close to downtown. Loved the front porch!! We enjoyed this wonderful home, met and exceeded our expectations. It was a short walking distance to town, very convenient. The home was very well equipped, not need to bring anything! We would definitely rent again if we return to the area! McDowell House is 3 blocks from the Woods Creek Trail, which winds down to the Maury River at Jordan's Point Park, connecting with university trails along the way. From Jordan's Point, walkers and cyclists can cross the Maury River bridge and pick up the riverside Chessie Trail. The property is also located just blocks from Washington & Lee's Lenfest Center for the Performing Arts; Lexington's Wednesday Farmers Market--with its fabulous local food; a movie theater; Sweet Things ice cream parlor; antique shops; restaurants; bookstores; and Healthy Foods Market. Back at the house, visitors can use the house's exercise machines, sauna, watch cable TV, relax with a book, enjoy the private back garden, with its goldfish pond--or play the c.1890 Knabe piano.